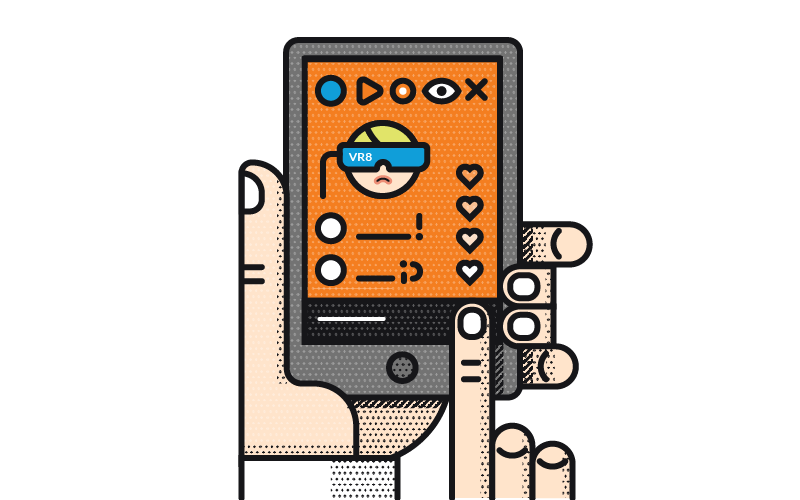 We combined a heavily participatory agenda with a couple of clever tech platforms to help facilitate a healthy discussion, allow us to interpret the group’s thoughts, and quickly come to a useable result. 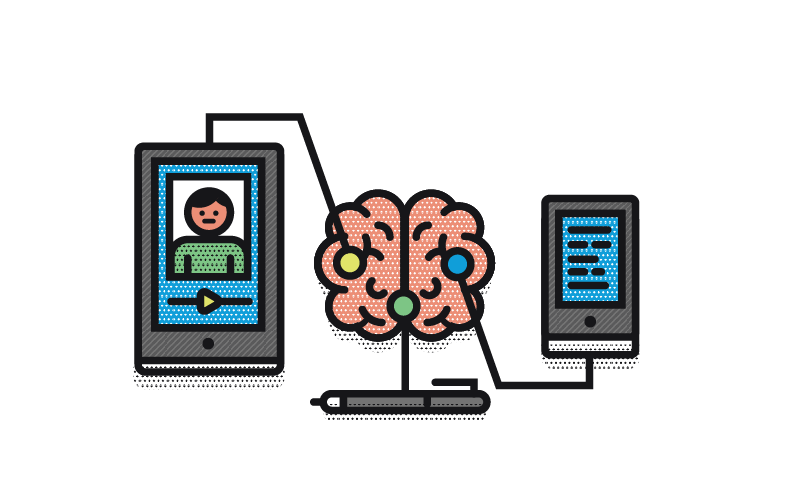 We’re writing about the processes and tech we used to give food for thought to meetings planners, HR managers or company founders, wrestling with the all-important topic of company values. We’re also demonstrating that ‘event-tech’ or ‘HR-tech’ can be used in flexible ways, even within small groups. 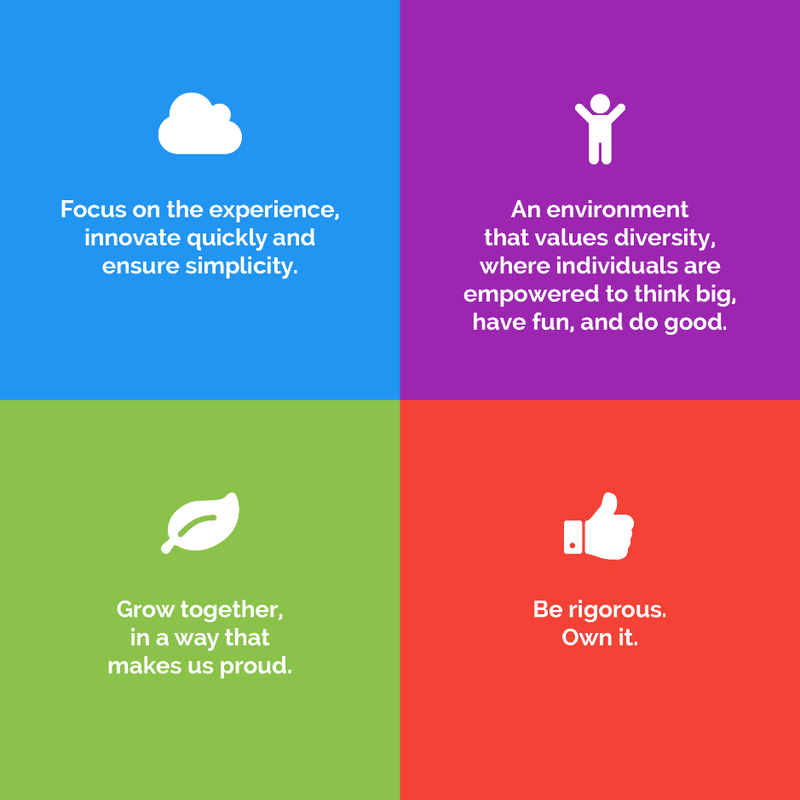 Why do we care about company values? Glisser is over three years old now, and we regularly visit our ‘Vision’ and ‘Values’ to ensure they’re still an effective interpretation of what we’re trying to achieve and how we want to ‘act’ to get there. Initially, the values and culture of a company are often a reflection of the founders, but as a company grows and develops the early members of the team can help shape and refine this. This is a good thing – new blood brings diversity, it challenges existing assumptions, and allows you to better find new ways of meeting customer needs. Values and company culture greatly impact the day-to-day running of any business: they can lead to increased productivity, improve employee morale and quality of work. Every company, big or small, should care about getting their culture right, and codifying this in values that correctly represent the people that will be living them. How did we design the meeting to facilitate discussion? With this in mind, we embarked on a series of team discussions designed to ensure everyone understood what Glisser’s vision is, and what the term ‘values’ means. We then looked at how company values correspond with the values we have as individuals, and gave everyone the chance to anonymously interpret Glisser’s current culture. 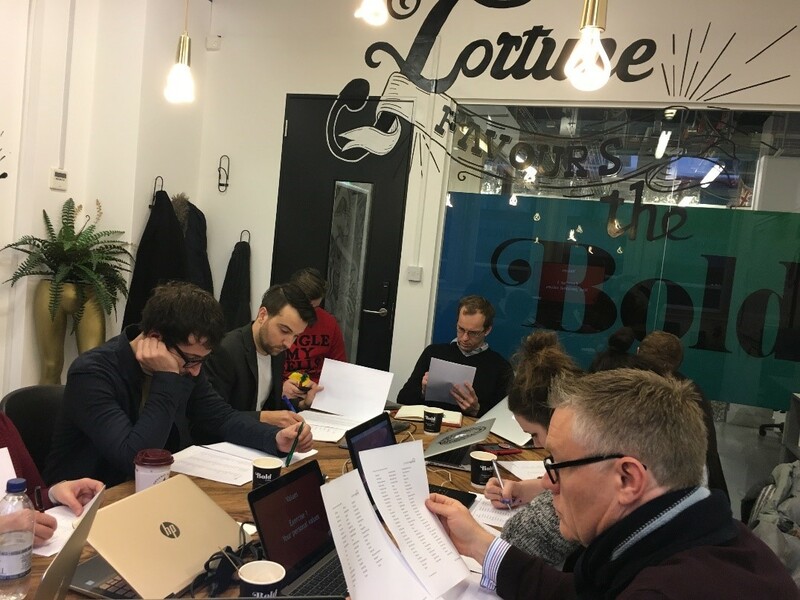 We then set about long-listing and defining the values we felt were important for the company, before condensing them into a set of meaningful and digestible values we could all believe in. Finally, we went through an analysis of the dynamics of the Glisser team, and how this matched to the values we’d defined. Of course we utilized Glisser (our own content sharing and audience response system) to facilitate various elements of the day! We also used an HR-tech product called ThriveMap to analyse each member of the team’s preferred working style, assess our diversity, and better understand how to get the most out of the group. We used the picture polling and interactive quizzes features to try to let the team try to guess which company values corresponded to which company logos, including Google, Facebook, Virgin and Nike. This was a great way to help explain what company values were, and how these brands have chosen to describe them. We used the audience Q&A feature across two exercises. 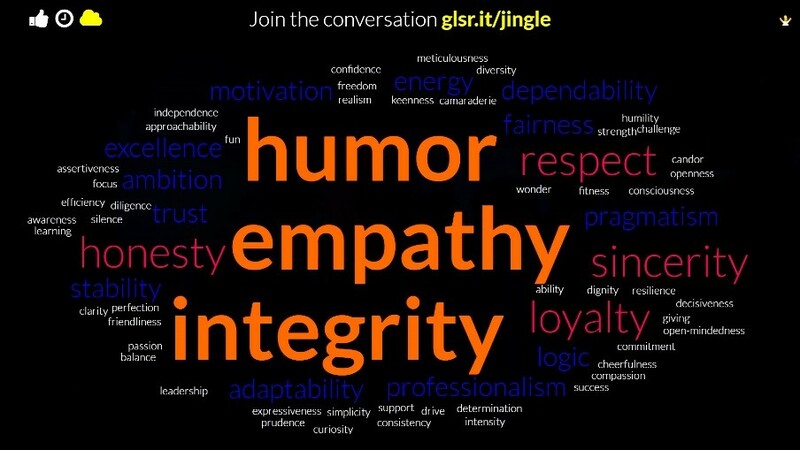 First, we each identified ten ‘personal values’ from a printed list of 400, that we felt were important to us personally, tapped them into Glisser using our smartphones and laptops, then used the moderator and word cloud features to visualize these in an instant. Next we cleared the results (after capturing the final word cloud) and went through the same process to each define the ten values we felt most reflected the company currently. The differences between our personal values and our collective interpretation of the company’s current values provoked some interesting discussion. Why were they different? Is that a bad thing? What was missing from the company values that we should be driving for? From each word cloud and ensuing discussion, we started to formulate our new company values noting which ones overlapped and the merits. 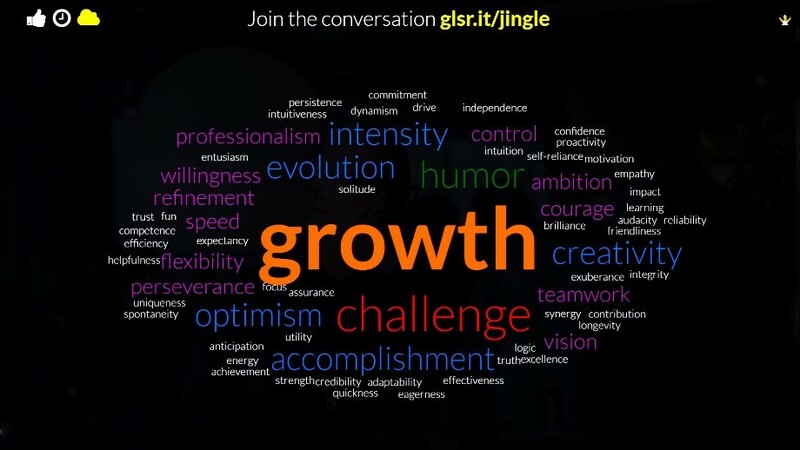 Glisser’s Q&A feature enabled each team members’ opinion to be heard. Next, we used the ‘Upvote’ feature to allow us to collectively quantify the values we liked, and think should be part of Glisser going forwards. In under a minute we’d established a ranking and consensus on key values – this was significantly more effective than trying to do this with a whiteboard alone. From this point, getting the basics of our four new value statements in place was relatively easy. Here’s what we came up with…. There’s still some wordsmithing to be done, but we hope that you like where we got to in just over half a day. Subscribe to our blog to see how they develop from here. 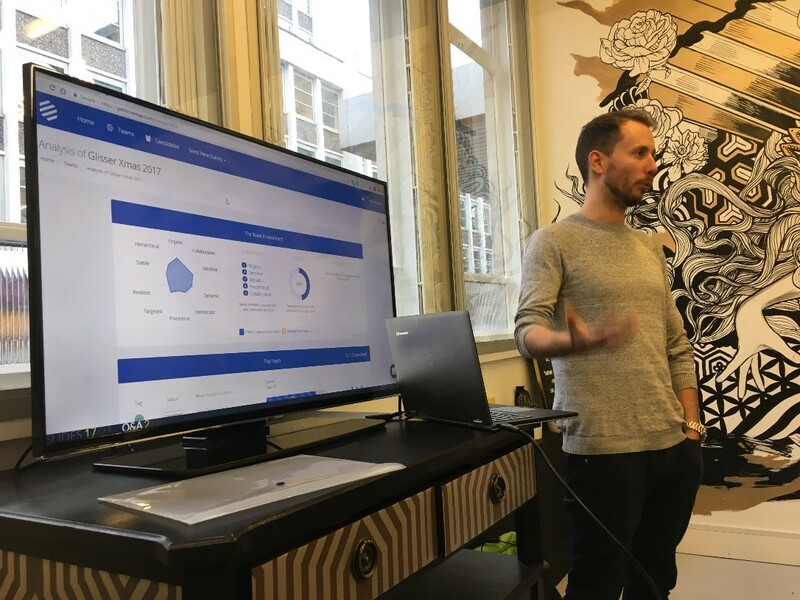 In the afternoon session, we were fortunate to have Chris Platts, co-founder of ThriveMap, to give us an overview of the results from the survey we each completed the day before. By discussing our individual ThriveMaps, comparing them as a team, and reviewing how these aligned with the values we’d just created, we were able to quickly ensure there was a strong fit. We combined the Glisser and ThriveMap data to help to start the process of enshrining our values into our culture, and individual roles, to ensure they are lived and breathed each day, rather than just a nice exercise to go through once a year. Hopefully, a few ideas here for other companies thinking about taking on this all-important subject!